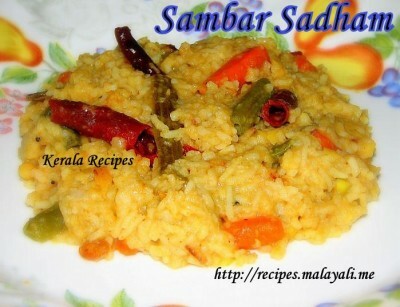 The ingredients used in this recipe are more or less similar to the recipe for my Kerala Sambar. 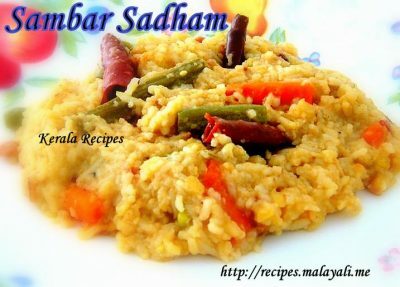 There are many ways to cook Sambar Sadham. You can either pressure cook rice, lentils and vegetables together with all the powders and seasonings. Or, you can can add seasonings after pressure cooking rice, vegetables and lentils. Another method is to cook the vegetables separately, while pressure cooking rice and lentils together, and then combine everything. And some people cook rice, dal and vegetables separately and finally combine everything together along with all the seasonings. I used the first method which is the easiest but if you don’t want your vegetables to be mushy, then probably you can cook those separately. You can add any vegetables of your choice like carrots, green beans, potatoes, drum sticks, brinjal, ivy gourd, okra, tomatoes etc. Avoid using cabbage and other vegetables which become soggy. First, soak the Basmathi Rice and Toor Dal separately in water. Then chop all the required vegetables and keep aside. Soak the tamarind in half cup of warm water. Heat a non stick pan and splutter mustard seeds. Add shallots, dry red chillies and curry leaves. Saute until the shallots begin to brown. Reduce heat and add sambar powder, red chilly powder and coriander powder. Stir fry for 2 minutes until it becomes nice brown color. Switch off the stove and add asafoetida and fenugreek powder. Keep stirring for 2 more minutes. Heat a pressure cook and add 2 tbsp of oil/ghee. Add the onions and green chillies and saute for a minute. Throw in the diced vegetables and garlic along with turmeric powder. Saute for a few more minutes. Next, extract the juice from the tamarind and add it to the cooker. Add all the roasted seasonings to the cooker. Mix well and add salt to taste. Cover and pressure cook for upto 3 to 4 whistles. Serve with pappad, pickle and curd.